In high school, I would annually carry around my little orange box for Trick or Treat for UNICEF (at school mostly) and feel it slowly but surely fill up with spare change that would get donated to the organization. A few times, I actually went door-to-door as well. 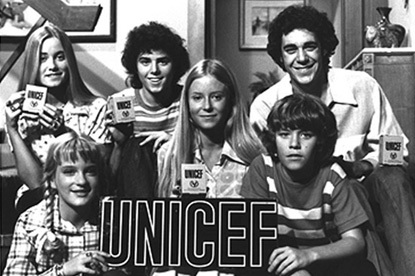 UNICEF (the United Nations Children’s Fund) is a global organization that saves kids’ lives in over 150 countries by providing clean water, nutrition, medicines, education and aid in emergencies (taken word-for-word from the UNICEF website). I found out that in 2005 kids set a record by collecting $18.25 MILLION in order to help kids affected by Hurricane Katrina and the Indian Ocean tsunami (stat from here). That’s a lot of donations! Evidently, this year marks 60 years of the tradition. I found this out in my UNICEF e-mail newsletter today. This is remarkable! A small gesture that was started 60 years ago is continued even now by elementary, middle, and high schoolers, and of course adults. I’ll be taking my 2 (very heavy) jars of change over to the Coin Star soon to donate them… Did you know that when you choose to donate it to charity Coin Star doesn’t take a percentage like they do when you just do it for yourself? Next Next post: Hare-brained Idea?